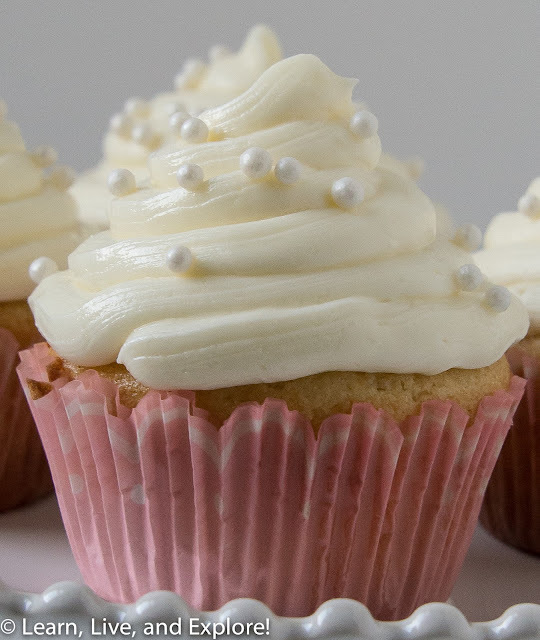 February Cupcake of the Month - Champagne Cupcakes ~ Learn, Live, and Explore! For the past few months, I've been showcasing a cupcake design and not a cupcake flavor for the cupcake-of-the-month posts. In selecting this month's cupcake, I was going to continue the trend and do something romantic and frilly, like making icing roses in soft pink to lay atop piped ruffles. But then I saw a post by one of my favorite bloggers - Sprinklebakes - for sparkling champagne cupcakes and realized it was perfect. It gave a nod to the whole romance of February and Valentine's Day, but didn't go overboard and remained singularly focused on the one highlighted ingredient. 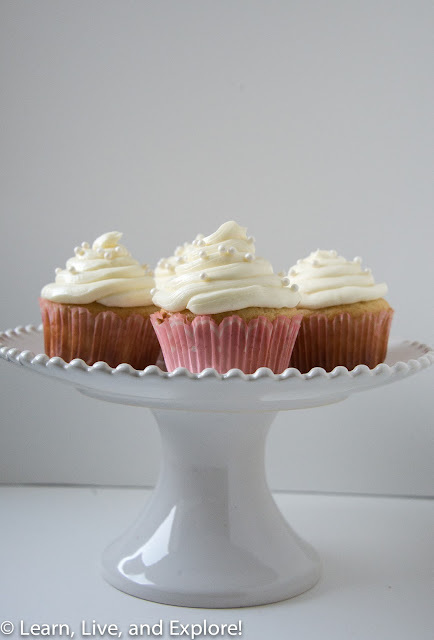 And I liked the idea of challenging myself with a scratch cupcake instead of cheating with box cake mix, like in past posts when I knew the cake wasn't high priority since what was on top of the cupcake mattered the most. Good news, while this cupcake calls for a lot of champagne, there should still be just enough left in the bottle to pour yourself a glass and toast to a job well done! Sprinklebakes has a lot of details and photos on her post (click here), so I'll let her explain all of the steps. Make sure to read everything before you start each of the components - unlike me who missed the part about reducing the champagne before adding it to the buttercream! Let's just say that with a cup of champagne in your frosting, there is no amount of confectioner's sugar you can add to make it anywhere near thick enough to be even close to a buttercream. I paid for that mistake because I had to forfeit my glass of champagne from what remained in the bottle to make a new batch of buttercream.